Home Общество Cham Books English Cham Books Publishes Latest Book by Woo Myung, Founder of Maum Meditation, Titled "The Living Eternal World"
Cham Books Publishes Latest Book by Woo Myung, Founder of Maum Meditation, Titled "The Living Eternal World"
People are born in the world and live their lives only to be met with death in the end. However, what if there was a living eternal world to where one could escape from the monotony and meaningless limited human life? The English version of “The Living Eternal World” written by teacher Woo Myung, the founder of Maum Meditation, lecturer, and author of numerous best sellers, has been published and is being applauded by many around the world. In the past, various books discussed the idea of a world of eternal life or an ideal world. Yet, no book had provided the precise method to actualize such a world until now. In 2012, teacher Woo Myung’s other recent book titled“Stop Living In This Land, Go To The Everlasting World Of Happiness, Live There Forever” hit Number 1 on Amazon.com and also made the Amazon Top 100 Best Seller list for all of 2012. 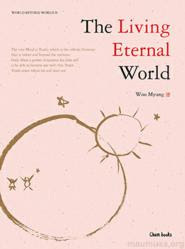 Like his previous works, teacher Woo Myung offers hope that anyone can go to the eternally living world while living. Written in poetry style, teacher Woo Myung introduces the method of human completion: Subtraction. During the Information Age, accumulating a wealth of knowledge was considered a virtue. While people may reap benefits from the widespread availability of information on any given topic, the downside is that many also suffer mental pain, stress and lethargy, due to the loss of humanity within the knowledge. However, teacher Woo Myung explains that the dawn of a new era has begun. No longer the era of addition, now is the era of subtraction. He earnestly teaches that a world of oneness – where my country, your country, my religion and your religion no longer exist – a beautiful world where everyone lives for others can be achieved through the method of subtraction. “The Living Eternal World” also explains the teachings of each religion while simplifying the abstract words of truth that people could not easily understand in the past. This clarification enables the reader to comprehend the true meanings and also provides the ultimate solution to peace that humankind has been searching for all this time. Teacher Woo Myung explains that everything in the world comes from the world itself that is the origin which is the never-changing eternally living universe. Moreover, if human discards and cleanses his mind, i.e., karma and habits that he himself accumulated during his lifetime, he can return to the pure mind of the universe that is his true nature. This is the method to live eternally. The simplicity of his method to accomplish this continues to cause a sensation around the world. “The Living Eternal World” is composed of six parts – “True Mind, Faith, The Time for Completion Has Come, What Is True Love?, The Mind of God, and The Path to Truth.” Each part fully and profoundly explains the writings of each topic. The core of teacher Woo Myung’s writings is simply about truth. The widespread appeal is derived from the universality of his words which embrace readers of all backgrounds. Teacher Woo Myung teaches Truth and writes, “Man has wisdom when his self no longer exists.” He assures the reader that truth is no longer difficult or complicated and that everyone is the existence that can live eternally by accomplishing human completion. “The Eternal Living World” is also available in Kindle version. Woo Myung is the founder of Maum Meditation as well as the bestselling author and poet of numerous books. In addition to being actively involved in writing, teacher Woo Myung also provides lectures worldwide. His recent book, "Stop Living in This Land, Go to the Everlasting World of Happiness, Live There Forever" was recorded in the Top 100 bestseller list of 2012 on Amazon.com. Woo Myung was the first Korean single author to have achieved this record. In 2002, the International Association of Educators for World Peace, UN-NGO awarded teacher Woo Myung with the Mahatma Gandhi Peace Prize and appointed him as a world peace ambassador for his dedication and contribution of Maum Meditation to society which provides the method to introspection and actualize peace for all of mankind.